Furnish and install 2000 LF of 11.75" micropile and 200 LF of 400 kip Tiedowns. The DMP Pile Caps were constructed where excavation was not possible adjacent to an existing paper mill structure's convention h-pile foundations. Drilling was through historic fill, marine sediments, and glacial till routinely within 18 inches of the existing structure. The construction sequence required 2 massive 1500 CY tissue machine foundations to be placed ahead of our work. 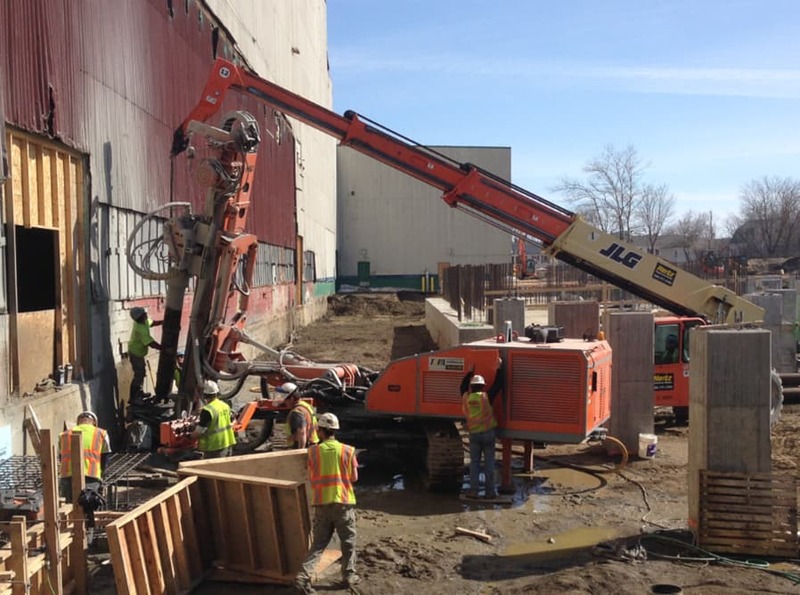 This left MD&B a 24 foot wide corridor to install 50% of the piles. With an accelerated schedule MD&B provided 2 drilling machines to balance access requirements with production. Where access was limited a smaller machine was used and we improved productions with a larger machine when access opened up. The Micropile and Tiedowns were installed on schedule. We completed the project without any changes to our lump sum contract price. You and your men were great to work with on Stray Winds Farm Phase 2. Your crews were professional, organized, and efficient. I hope to work with you again in the future."